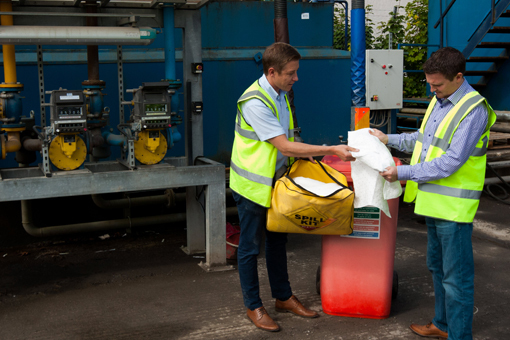 It is vitally important that any large industrial manufacturer keeps absorbent products on-site due to the oils and chemicals they use during their manufacturing process. However, figuring out what spill products are needed and keeping them at the correct levels can be a headache for many companies. One of our customers – a leading manufacturer in aircraft parts – asked us create and implement a bespoke process to make sure the correct type of spill products were located at required points throughout their premises in order to meet with legislative requirements. We first completed a survey of their three sites to identify which spill products were needed and where then installed dispensing stations at these points. In addition, we created concise information posters about each product and conducted staff training. As part of our ongoing support, we carry out monthly checks on each spill station and top-up products to ensure levels remain correct. The systems we implemented have helped our customer work towards their ISO 14001 accreditation.